Cyclists in search of the ultimate sweatband need look no further than Sweat GUTR, described by senior coach Jake Rubelt of Carmichael Training Systems as "one of the few things that you can buy these days that really makes your riding and racing experience better." Sweat GUTR is the only sweatband that is completely saturation-proof. It is lightweight, fully adjustable, comfortable, easy to clean, and built to last. The band captures and channels dripping sweat, preventing it from running into your eyes and blurring your vision. The sleek design of the Sweat GUTR allows for improved air flow, while the sides of the band are vented for added flexibility and comfort. "The sweatbands are great," says Australian Defense Force cycling coach Mick Rand. "The guys I've trialed with have all given them the thumbs up." Duane Morrow, the first-place finisher in the wheelchair division of the 2007 Nashville Country Music Marathon, said Sweat GUTR is a "great product for all athletes, but especially for those of us on wheels!" "I could tackle technical descents with confidence," raves Cat 1 racer Malcolm Sawford. 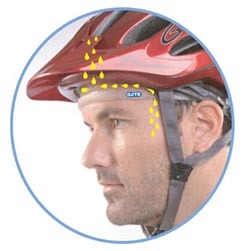 Rite Aid professional cycling team member Peter Penzell says Sweat GUTR "actually works. (It's) very comfortable and thin, simple yet effective. I would recommend it to anyone." The Sweat GUTR is available in two styles: a frost-colored band with a blue logo and a smoke-colored band with a white logo. The MSRP for the Sweat GUTR is $19.99. For more information about Sweat GUTR products, please ask your favorite bicycle dealer to contact ProNet Cycling at (800) 279-3793, or visit www.pronetcycling.com.